electrical resistivity lower (higer electrical conductivity) and to make thermal conductivity lower as well. However, it is difficult to obtain both reducing thermal conductivity and increasing thermal electromotive force (TEF) since it often happens that TEF decreased by reduction of thermal conductivity. One of the solutions is to add oxide thermal electrical semiconductor to original device. waht is the solution of this antinomy to improve the performance of thermoelectricity ? 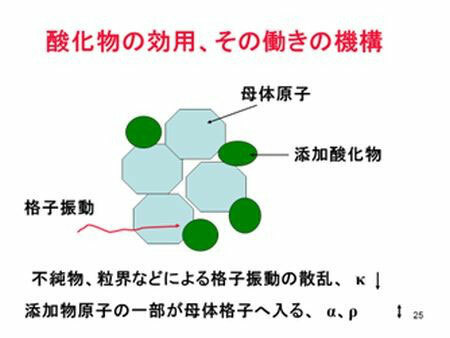 We have to make thermoelectric semiconductor a progressive debut by finding the solution of this problem. We know application of "cooling" using thermoelectric semiconductor such as wine cooler, optical fibre, CCD camera, etc.,but not application of "electric power generation". 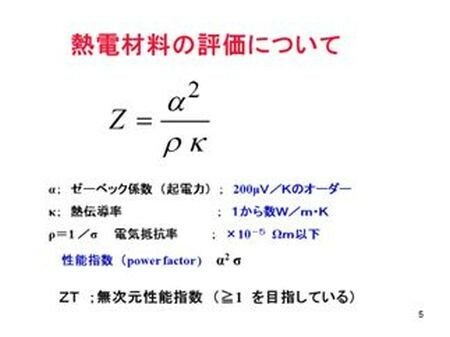 As you can see in above formula, thermal conductivity and electrical resistivity ( in other words, good electrical conductivity ) should be reduced. However, when electrical conductiity increases, thermal conductivity enhances in generally. The oxide may be a rescuer !